Otto V, called the Tall / Long (der Lange) was born around 1246,the second son of Otto III and Beatrice, the daughter of Wenceslaus I of Bohemia. He was the great, great grandson of the first Margrave of Brandenburg Albert the Bear of the House of Ascania, ruler of the Northern March. On the death of his grandfather Albert II in 1220, Albert’s two sons, John I and Otto III (the pious) jointly ruled. By most accounts the brothers ruled in accord. Working together the two expanded their territory and influence. 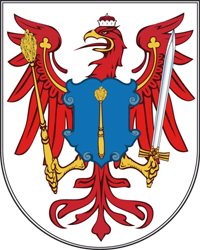 It was under their rule that the Margraves of Brandenburg gained the status of Prince Electors and the hereditary post of Imperial Chamberlain of the Holy Roman Empire. They embarked on many development projects and it was commonly held they were founders of the city of Berlin. Although recent evidence may show that a settlement probably existed there before their rule, it is generally accepted the brother’s development efforts made possible the city’s rise and expansion. Sometime before their deaths John and Otto split Brandenburg into two states. 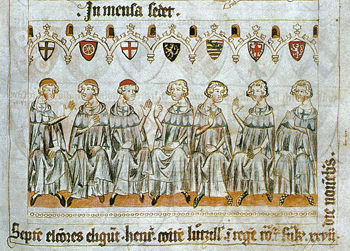 John II, Conrad, Otto IV (With the Arrow), and Henry I (Lackland), four sons of John I, would co-rule Brandenburg-Stendal upon his death in 1266. John III, Otto V (the Tall), Otto VI (the Short) and Albert III, four sons of Otto III would co-rule Brandenburg-Salzwedel upon his death the following year. By 1267 there were effectively eight co-rulers who claimed the title of Margrave of Brandenburg. John III died within a year after his father leaving Otto V the eldest and the senior ruler of the Brandenburg-Salzwedel branch of the family. It is also clear that Otto IV was the most visible and active of the Brandenburg-Stendal family acting as the senior ruler of his branch even through he was not the most senior in age. In historical sources, Otto IV is clearly depicted as the most dominant of the Brandenburg Margraves. It is less clear the exact nature of the shared rule between the brothers and cousins. It seems likely that Otto IV and Otto V, as the respective heads of the family, co-ruled and the Margraves shared their responsibility and title with their brothers. As may be expected under such an arrangement, internal disputes over alliances and co-rule arose between the two family branches. Otto’s maternal grandfather was King Wenceslaus I (the one-eyed) of Bohemia and his uncle was Ottokar II, son and sucessor to Wencelaus. His close relations to the Bohemian royal family meant that he, his brothers, and his cousins would often be drawn into the politics and conflicts of that kingdom and as electors, the politics and conflicts of the faltering Holy Roman Empire. By 1245 the Holy Roman Empire was in crisis due to a protracted feud between the emperor Frederick II and the papacy. Upon the emperor’s death in 1250, there would not be another ruler who could bring forth the necessary power and influence to make a claim to the throne, enforce his authority, and achieve universal recognition, for more than 50 years. During this time, commonly referred to as the Great Interregnum, the member princes would quarrel over territorial claims and achieve a greater level of independence in their actions. Shortly after the death of the emperor, King Wenceslaus and his son Ottokar (who had rebelled against his father and was thrown in prison) made peace. Together they looked to take the highly contested Duchies of Austria and Styria which remained without a ruler since the death Duke Frederick II (the Quarrelsome) in 1246. Frederick was killed after provoking, and losing, a border dispute against King Bela IV of Hungary. It is unclear whether they invaded and imposed their rule on Austria or if they were invited by the nobles to take control and bring stability. Either way, by 1251, Ottokar II was made Margrave of Moravia and upon entering Austria he was proclaimed Duke. He would add the title of King of Bohemia in 1253 with the death of his father. He had hoped to be elected King of Germany (the Romans) upon the death of Konrad IV in 1254 but was passed over in favor of the much more pliable Richard of Cornwall. Ottokar's claim to Styria was challenged by his cousin Bela IV of Hungary who gathered a coalition to oppose his expansion. An uneasy truce was made but quickly broken resulting in military conflict in which Bela was defeated and forced to relinquish his claim to Styria in favor of Ottokar in 1260. Ottokar then led several campaigns against the pagan Old Prussians, further expanding his growing empire. Upon inheriting Carinthia and Carniola in 1269, he became the most powerful prince of the empire and thus, he thought, the logical next choice for emperor. Ottokar's rapid ascent alarmed the electors and In 1273, he was again passed over, this time in favor of Rudolph I of Habsburg. Ottokar refused to recognize Rudolph as emperor and in turn, Rudolph placed Ottokar under an imperial ban and proclaimed all lands that changed hands after the death of Frederick II were to be given over to the crown. This would mean the loss of much of Ottokar's gains and would severely weaken his position. War between the two seemed inevitable as both men began to enlist allies. Rudolph would summon a coalition of Austrians, Hungarians, Swabians, Styrians, and Bavarians. Ottokar's Bohemian forces would ally with his cousins, the Margraves of Brandenburg, as well as the Margrave of Meissen, the Silesians and the Polish Princes. Both forces were bolstered by large contingents of mercenaries. The forces of Brandenburg under Otto V and Otto IV accompanied Ottokar II and his allies who entered Austria and besieged several cities. Rudolph marched to face him and the two forces clashed in August 26, 1278 near Durnkrut. With as many has 80,000 men combined, what would commonly be referred to as the Battle on the March Field would be one of the largest military clashes of the middle ages. After hours of fighting and an ambush by Rudolph, considered at the time to be dishonorable, Rudolph emerged victorious and Ottokar lay dead on the battlefield. His body was collected and displayed in Vienna as a show of Rudolph’s triumph. This significant victory was a pivotal event in the rise of the Habsburgs. Rudolph’s descendants would go on to rule Austria and dominate the Holy Roman Empire for more than 6 centuries. Although they fought for the losing side, the Margraves of Brandenburg benefited from their association with Ottokar both while he was alive and after his crushing defeat. They profited from serving Ottokar during the time of his rapid rise and during is military campaigns as they gained greater wealth and political prominence in the region. After his death, Rudolph allowed Ottokar's son Wenceslaus II to become king. As Wenceslaus was only seven at the time, with the consent of the nobles of that land, Rudolph appointed the Margraves of Brandenburg as regents for the young king in 1279. The five year regency of Otto V and his cousin Otto IV is depicted by Bohemian sources as one marked by plague, starvation and unbridled greed. Their young king is depicted as a helpless captive of foreign rulers. He is said to have been held prisoner in Brandenburg and not allowed freedom of movement. Wenceslaus II returned to Bohemia in 1283 at the age of twelve. The regency of Brandenburg ended only, it is said, after extracting a ransom for his return and after he relinquished his claims to Upper Lusitania to the Margraves. Wenceslaus II would go on to be a capable ruler and, oddly for one who was said to have been held captive, maintained a good relationship with his cousin Otto V and his fellow Margraves. In 1286, Otto VI, younger brother to Otto V, abdicated to become a Knight Templar and later a monk. His youngest brother, Albert III, remained but was never more than a junior partner. Otto V himself was in sole control of the Ottonian (Salzwedel) branch but was still eclipsed by his cousin Otto IV (with the arrow) who was clearly the head of the Johannian (Stendal) branch and the more visible and dominant of the Margraves of both branches. It is known that Otto V and Otto IV would clash over disagreements concerning internal and external issues and politics. Disagreements turned to hostilities between the cousins when they sided with different candidates to take up the German throne upon the death of Rudolph in 1291. Otto V would support Adolph of Nassau while Otto IV would support the Habsburg candidate, Rudolph’s eldest son Albert I. Although Adolph would be elected emperor, his troubled and ineffective rule would end with him being deposed by the electorate in favor of Albert I. Refusing to step down, the two fought and Adolph was killed at the Battle of Gollheim in 1298. "The seven electors choose Henry, Count of Luxembourg, as King of the Romans at Frankfurt on the 27th day of November." The electoral princes are identified by the coat of arms above their heads, from left to right are the archbishops of Cologne, Mainz, and Trier, the count palatine of the Rhine (count of former Electorate of the Palatinate), the duke of Saxony, the margrave of Brandenburg, and the king of Bohemia. At this time Henry I, youngest son of John I, was the dominant Margrave. By 1298, Otto V was also dead. The exact circumstance and date of his death are unknown. He is thought to have been buried in Lehnin. Otto V was briefly married to Catherine of Poland but this marriage ended quickly with no issue. Before 1270 he Married Judith of Henneburg-Coburg with whom he had Issue including several daughters and his eventual successor, Herman the Tall. All of whom would marry into Polish, Bohemian, and German royal families. The Ottonian line of the family would die with John V, son of Herman the Tall, Grandson of Otto V, in 1317. He was 15 years old when he died and passed with no issue. The Johannian line of the family would die with Henry II (the child) who also died young and without issue in 1320. The death of Henry II marked the extinction of the Ascanian dynasty and Brandenburg would fall under the control of the Emperor Louis IV of the House of Wittelsbach. Louis IV would cede Brandenburg to his son Louis V who would rule as Louis I (the Brandenburger).